Established in 1964, the Polk County Developmental Achievement Center (DAC) provides day training and habilitation services to adults with developmental disabilities. Governed by a board of directors of interested and committed citizens from western Polk County, the DAC is licensed by the Minnesota Department of Human Services. 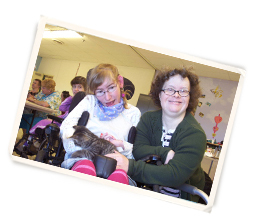 Our mission is to promote and support individuals with disabilities to acquire, improve and maintain enjoyment and quality of life through individualized programming. Our philosophy is "clients come first!" We attempt to base all our decisions on this premise and this is our guide when developing programs. We do not sell, rent or lend the e-mail addresses or mailing addresses of our supporters. Things you might not think of are associated with costs. Read tips to avoid being sluggish. Apply these same techniques to programming. Learn how to teach a person to regulate their own actions. Plan ahead for any trips. Read and learn about surviving an illness. Tip for working with a person with Autism. Read the tip of the day for Parents or Grandparents. Sometimes we all need a little bit of fidgeting. Importance of keeping your hands busy. Consider the activity level of your child and how they engage with their environment. Shredding Needs, we can help! How can you support people with disabilities. Any person earning less than minimum wage MUST go through career counseling. If under age 24, more is required. Anthony DuChenne does a building check for safety concerns. MOHR posted in the Star and Tribune. Great experiences at this work site. Consider choices for programming and how we can assist our clients to make decisions.